In the late 19th century many young men and women worked in shops because they didn't want to be labourers or tradespeople. But while they were indoors and kept their hands clean, they worked long hours without breaks. It is self evidently unjust to...[keep] them for hours in unnecessary and profitless attendance in shops – as if they had no higher, no nobler destiny than to be used as mere machines for the retailing of goods! State Library of Victoria, Naked Democracy Exhibition, Keith Murdoch Gallery, 2 June–1 October 2006. In the evening, a mad rush of shoppers flooded stores. And since customers were doing most of their shopping at this time, shops were fitted with gas lanterns which gave off noxious fumes. A young man may stand it for about 10 years, but it will eventually make the strongest man unfit for work - it very nearly killed me. 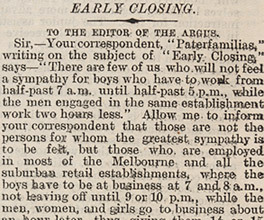 The other problem for workers was store opening hours – no one could agree on them. If a shopping strip agreed to close early, there would inevitably be one shop that refused and made a tidy profit as the only shop open during rush-hour. After almost 30 years of debate and public petition, the Early Closing Association called on the government to limit shop trading hours. The result was the Factories and Shops Act of 1886, which ordered shops to close by 7pm on weekdays and 10pm on Saturdays. Many shop owners didn't want shorter hours, believing that their competitors would get all the late shoppers. Ignoring the laws, they stayed open late and paid fines as a result. This practice continued for the next hundred years. Today shops still operate for long hours – some 24 hours, 7 days a week. However there are now much stricter regulations that outline how long people can work and under what conditions, and we owe those rights to the struggle for fair working conditions that began in Victoria over a hundred years ago.